Touch Calendar makes it easy to add custom repeating events including biweekly events, monthly events, and events that happen every Tuesday and Thursday. To add a repeating event in Touch Calendar, start adding an event in the usual way (tap-and-hold on a date or use the ‘Add event’ menu item). Then scroll down in the add event screen to see the ‘Repetition’ heading. 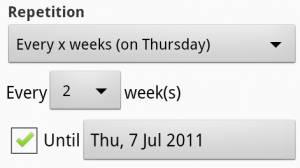 Under that you’ll see a drop-down box with options as shown here. To add a biweekly event, you should select the “Every x weeks” option. 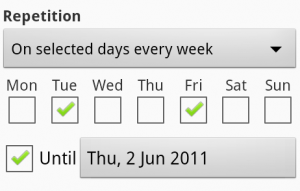 Then you’ll see further options appear below the drop-down box, after you how often in weeks you want the event to repeat, and if you want to set an end date for the repetition. 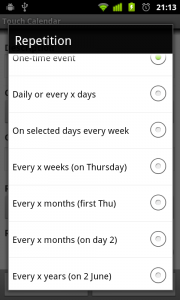 Alternatively, if you want to have an event repeat every Tuesday and Friday, you should select the “On selected days every week” option. You’ll then see a series of checkboxes appear for you to select which days you want the event to occur on, and again to allow you to set an end date.